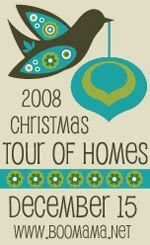 I‘m so excited to be in a wonderful Christmas Tour of Homes! (or two, or three…) It’s so much fun and I can’t wait to see everyone’s beautiful decorations! Remember, we do live in Florida so there’s not much of a White Christmas going on here…unless you count the sand on the beaches! I hope my pictures give you a little taste of a Florida Christmas and thanks for stopping by! The wreath on our front door reflects our love for the water! We are steps from Charlotte Harbor and enjoy the warm sea breeze at this time of year… I think it was about 80 degrees outside today!! Some days I love that, and some days I long for a little cozy cottage with snow on the ground. Our Christmas Tree is a VERY special thing for us! For almost 20 years, we’ve been collecting ornaments from all over the world for our tree! Whenever we travel to a new place, we find a cool ornament to help us remember the trip. So we talk about our trips while we decorate. It’s a blast! My husband wrote a post about our Blessing Tree and here’s a picture of the “work-in-progress”. Isn’t my helper cute? Our Palm Trees in the front yard are decorated with extra large metal starfish! These are some of my favorite things! The colored lights reflect off of them for a beautiful shimmering look! Well, the last photo is of a little collection that I have on our dining room table. The little snowman bucket was purchased by Tim last year! I love it! He doesn’t really shop (ever), so that makes it extra special! I have a great recipe for Reindeer Cookies…they’re so easy and cute! 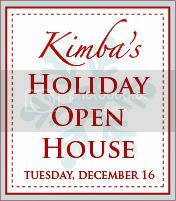 Thank you BooMama and Hooked on Houses and Kimba’s Holiday Open House! I absolutely adore your fantastic starfish wreath! Happy Holidays! Now how cute is that wreath! I also love that you decorated your palm tree out front. I may decorate mine too! Thank you for sharing your decorations with me. I LOVE the starfish wreath! This is too much fun, thanks for having us. You have a beautiful home and I’m envious of your nice warm weather. 🙂 Thanks for sharing! That blue piano is too sassy! I’m tucking that idea away for when we have kids…And I do the same thing with trips and ornaments! It’s a better souvenir than anything else, isn’t it? I love your front door wreath! So pretty! Come visit me at my house (blog)! I love the seashell theme. The piano is abit of a shock but it is pretty ha ha Thanks for Sharing! Lovely! Especially enjoy the touches of the sea you incorporated everywhere. And wonderful job on the piano, too! Since I decorated (kinda) in a blue and green theme, I want some of those poinsettas! Havin’ a hard time finding Christmas decorations of any kind here. Thanks for sharing you beautiful home with us! I like your Florida-inspired decorations, and your pretty piano with blue poinsettias. So cute! I just love the beach theme. I absolutely love the beach and would much rather live there. Everything is beautiful!! Thanks so much for stopping by my place. Your Florida Christmas decorations are awesome. And I absolutely love what you’ve done with the piano and how the flowers go right along with them. I love ornaments that have a story to go along with them. Hello Kim way out on the right/south coast of the U.S.A. What a great wreath and I love the colors that you painted the piano. Have a very merry Christmas!! Love the starfish wreaths, and thanks for stopping by my house tour (from Hooked On Houses, #60). My husband is in Tampa right now on business and I wish he could fly us all in where it’s warmer. He’s not quite ready to come home to 30 degrees and sleet. I love all of your decorations!! You did such a great job!! Thanks for stopping by!! Merry Christmas!! Love the decor! Best wishes to you and yours during this Holiday season. That’s my kind of decorating-your ‘recycling’ is awesome-the wreath and piano both rock! Everything looks just great! Love the starfish, and the wreaths. I love the wreath on your door with the starfish. Thanks for sharing and for visiting my place. Merry Christmas! How cute and fresh! I love the starfish on the palm trees!! Thanks for sharing (and thanks for stopping by my place today). I am in love with the starfish wreath! Thanks for stopping by earlier! Your home is beautiful….Happy Holidays! Oh wow – – – you are the second person in this tour that I have seen using real star fish as Christmas stars!!! You creative people – – – I would NEVER have thought of that. Might have something to do with being hundreds of miles inland, not sure!!! Everything looks great. I really like your original piano and think it looks great decorated with blue flowers. So creative! I love all the star fish! That is a really clever idea. Have a merry Christmas! WOW! That wreath with starfish is amazing! Loooove your temperature- here cold and snow… and cervical headache due to that!!!!!! Thank you for your comment- it was very much appreciated by the Bears, too!! Hi, Kim! First, thank you so much for stopping by my “house” yesterday and leaving a comment; it was great to hear from you! Your home looks wonderful and I love the special touches of FL, particularly all of the starfish! My husband and I have done the same thing with our ornaments: collected an ornament every place we go. It makes decorating the tree even that much more special and memorable. Although, I think I need to come up with a way to remember where they’re all from…do you write it down somewhere or do you remember? Thanks for opening up your home and Merry Christmas!! WOW! I LOVE your Christmas touches!! and that piano is AWESOME!! What a fun theme!! It is so fitting. Oh so lovely! I love the wreath on your door… too cute:). Merry Christmas! Thanks for your comment; the snow was a huge surprise for us last week! I love the starfish and non-traditional colors you used…I’ll be keeping those in mind when I decorate for myself next year! How to decide? How to decide? Since there were so many tours to pick from, I thought I’d visit as many ‘Kims” as I could. And girl, I love the blue piano – very fun and whimsical. Thanks for sharing! I’ve never seen decorations from a place that never sees snow. I love all of the starfish, and as much as I love the snow … seeing as how I just sent my man off to work in a blizzard, I am a little envious of your 80 degrees!!! Your home looks lik SO MUCH FUN!! I love the Piano, BTW, it is beautiful, distinct and unique. As I was scrolling down, I saw the reindeer cookies and thought – OH Yes! Must try those! Can I come and get a baking lesson? I’ll bring some Snowman Soup! Blessings and thanks for stopping buy. I will have a cup with your name on it the next time you stop in! I love the starfish wreath and the blue piano! Looks like you had a great time in Oregon. I live in Oregon and have never done that! Love the piano! I’ve been coveting starfish to add in my decor year round, but I love them at Christmas time as well! You’ve done such a great job making your home festive in warm weather. We’ve been having 70 degree weather here in Atlanta and it’s been hard to get in the spirit! Thanks for stopping by! I like the way your Christmas decorations reflect where you live. Merry Christmas!